With a few market risks on the horizon, namely Italian elections, the sequester, slowing U.S. economic growth and so on, Blackrock’s Russ Koesterich says there are four defensive strategies for investors looking to protect their gains. 1. Don’t overpay for defensive sectors like consumer staples and utilities. 2. Instead of focusing on sectors, think about strategies like minimum volatility. 3. Know where to get more fixed income. 4. “Know when to consider adding to Treasuries with a twist”. Investors can do this by buying TIPS in the event of a crisis. In his latest report David Rosenberg writes that “the era of consumer frugality ostensibly never went away despite a 125 per cent four-year rally, in the equity market”. The recent payroll tax hike has delivered an 8 per cent blow to discretionary spending for those making $40,000, and this is causing 46 per cent of the population to curb spending, according to the NRF. Morgan Stanley whistleblower Mark Mensack has revised his case against the firm and has filed a lawsuit in a New Jersey federal court. Mensack is also suing Finra. He accuses Morgan Stanley of intentionally hiding information and abuse of process among other. Mensack said he was forced to leave Morgan Stanley after he discovered an “illegal pay-to-play scheme involving assets in retirement accounts. Previously, arbitrators ruled that Mensack had to repay his bonus money and cover Morgan Stanley’s legal fees. 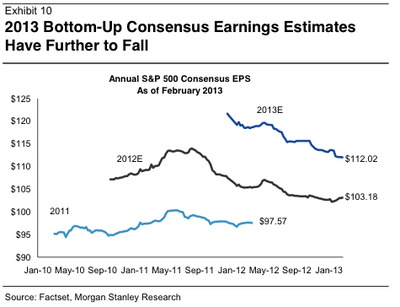 When stocks are flat or increasing as earnings decline valuations rise in what is known as multiples expansion. That means stocks are getting expensive and bears that have bases their these on falling earnings have a hard time reconciling this. Meanwhile, Morgan Stanley’s Adam Parker shows that earnings growth expectations have been declining and are expected to continue to fall. The number of American’s diagnosed with Alzheimer’s disease is expected to almost triple by 2050 to nearly 13.8 million this will add pressure on advisors. Thomas West a financial advisor with Signature Estate & Investment said, “as we move to a fiduciary standard, this is a gigantic bull’s-eye”. Some say that a written policy will help advisors avoid ethical and legal challenges. Steve Starnes with The Monitor Group says advisors should do a few things if they notice their client’s cognitive functions are deteriorating. These steps include updating the client’s legal documents and estate, encouraging them to see a doctor, and helping them pick an advocate.